For this trip to Korea, I did quite a lot of research and thanks to many blogs, our trip was so much fun. So I’m going to pay it forward by listing what we did in Seoul (: I’ve added info about some stuff we ate along the way because well, sustenance is important! The rule of thumb is if there are lots of people in the shop, you can’t go very wrong. I know I know this sounds very clichéd but Seoul is truly a shopping haven for all budgets. If you want 10,000 won items, head over to Ehwa Womans University. Ehwa was our favourite shopping area and we returned to that place twice! Use exits #2 or #3 and follow the crowds. 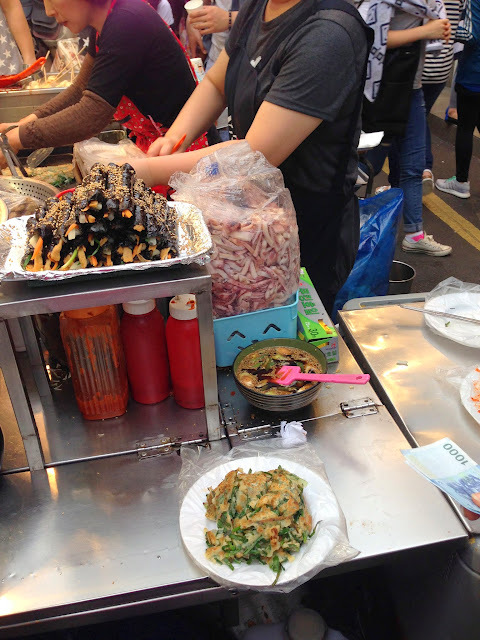 Don’t miss out on the street food while you are there. For a light bite, there is a pushcart selling fried chicken outside Artbox. While we were there, we saw queues all the time! The fried chicken was none greasy, crunchy, and mixed with other items like mini hashbrowns, cocktail sausages and tteokbokki (cylindrical rice cakes), and doused in a sticky sweet and spicey gochujang sauce. Along the streets we also bought a fish taiyaki which surpassed all the fish taiyakis I’ve every eaten in my life. 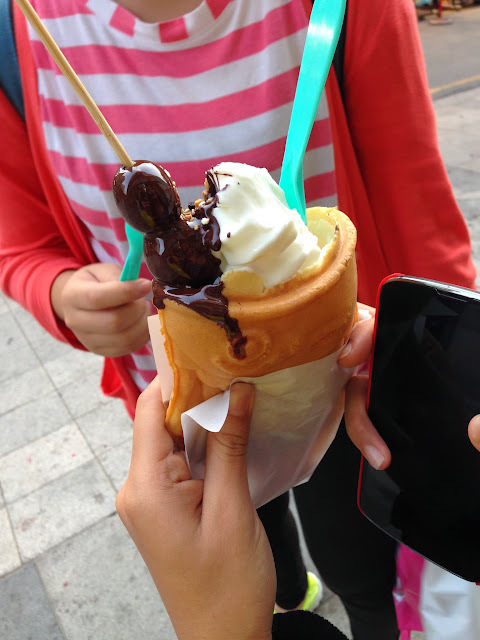 The crisp fish waffle was the perfect vessel for creamy froyo, topped with a decadent stick of fruit that was dipped in chocolate fondue. 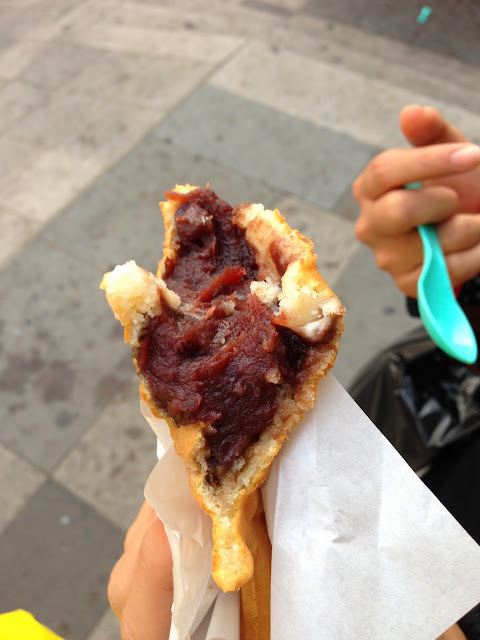 The body of the taiyaki contained loads of red bean (the other option is custard). A MUST-TRY! Another place for cheap clothes is the express bus terminal underground shopping mall. There are a couple of stalls within the metro itself but this is not the main shopping area. The mall begins when you get past the glass doors where you’ll see two parallel rows of shops. I was in awe because I couldn’t see the end! If you are looking for cosmetics, Myeongdong is the place you want to be. Each brand has not one, but a couple of stores within the vicinity. 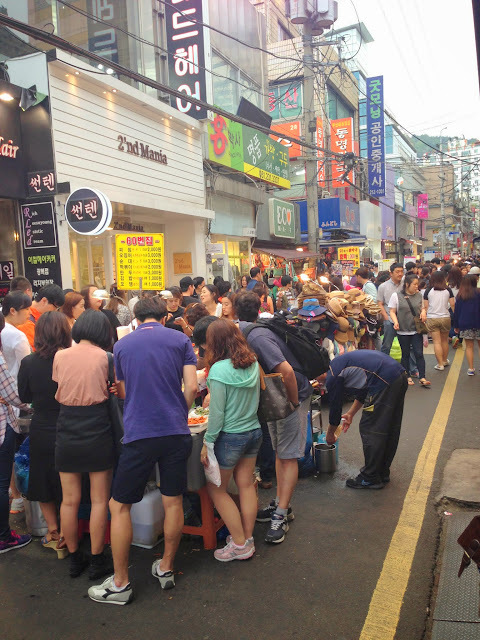 For korean high street fashion, try Doota at Dongdaemun. The prices are higher but there are a lot of independent korean designers in this shopping mall. Well worth a look especially if you are looking for a statement piece. 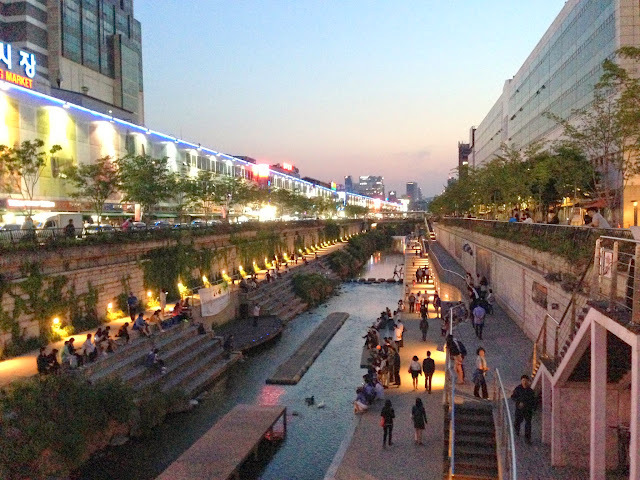 The Cheonggyecheon stream is within the vicinity. It’s like a little oasis in this area that is jam-packed with tourists and tour buses. The friend also recommended Lotte Young Plaza for more expensive but good quality pieces. It’s a pity I couldn’t squeeze in the time to check out this place. There are a couple of palaces in Seoul but I’m not that interested in architecture. 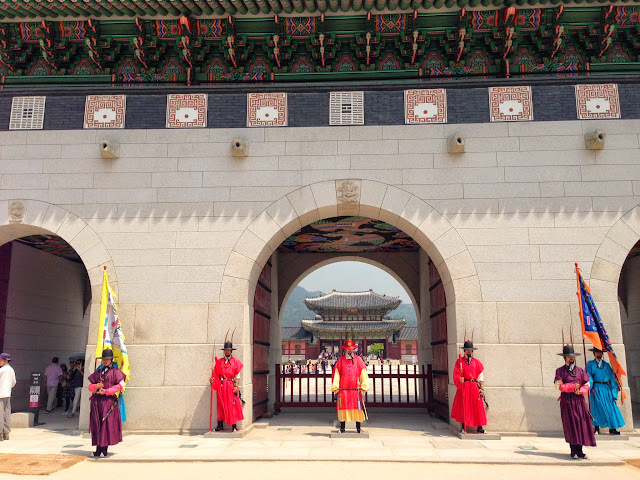 That said the walk in Gyeongbokgung was a nice introduction to the traditions of a country so steeped in history. I highly recommend following the free English tour- at least the guide puts all the buildings in context for you! 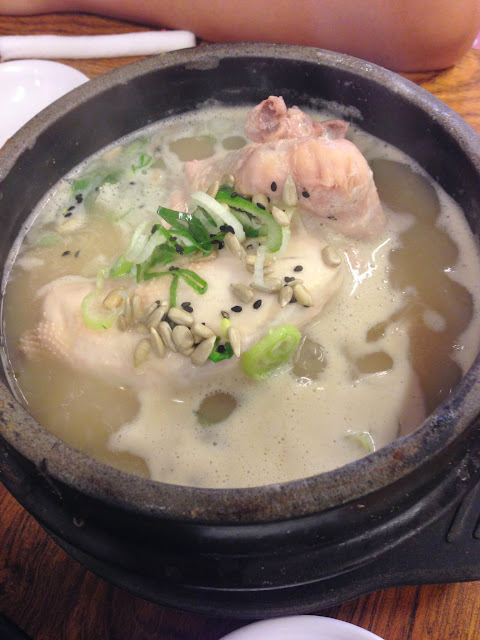 There is a famous Samgyetang restaurant called Tosokchon which is conveniently located near Gyeongbokgung. The ginseng liqueur that customers have to pour into the cloudy soup gives the ginseng chicken stew its heady fragrance. We loved the stuffing of glutinous rice, chestnuts, gingko nuts, sunflower seeds, pumpkin seeds etc. So delicious and nutrious! Do not be daunted by the long queues because the restaurant is huge and people eat quite quickly. Bukchon Hanok Village is also nearby. We stayed in a hanok for 2 nights. The futons were comfortable though for the price you can also stay in a cheap hotel. I think just 1 night is sufficient if you just want to give it a try (the hills in the area are NO JOKE). 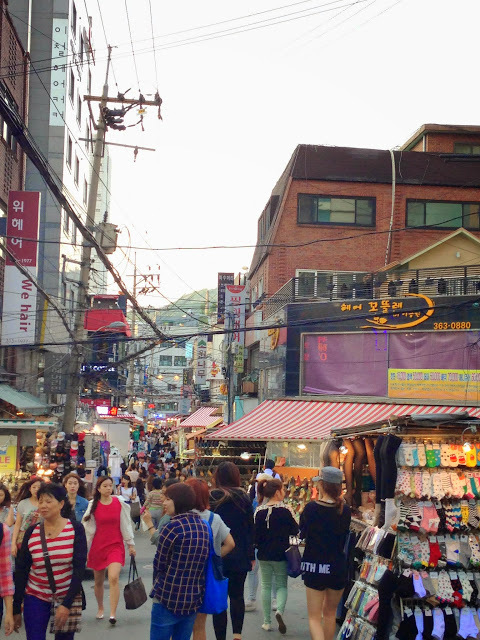 There are a couple of cafes within the Bukchon area and there is also Samcheongdong nearby. We had lots of fun at Yeouido Park! 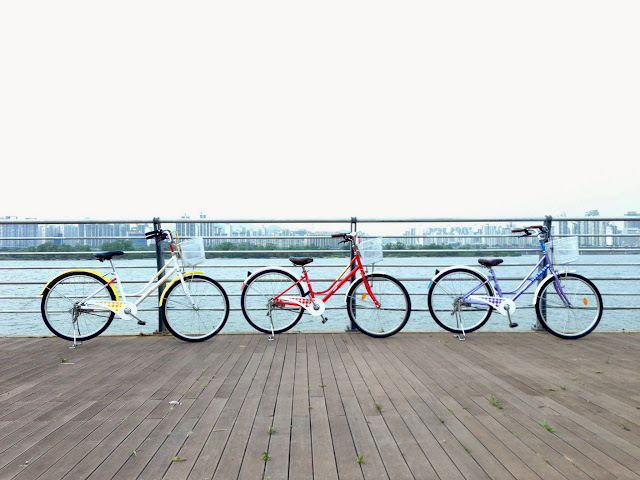 Bicycles are available for hire and the cycling paths here are great. Lots of pro cyclists use this track so try not to be an obstacle (like me) haha. 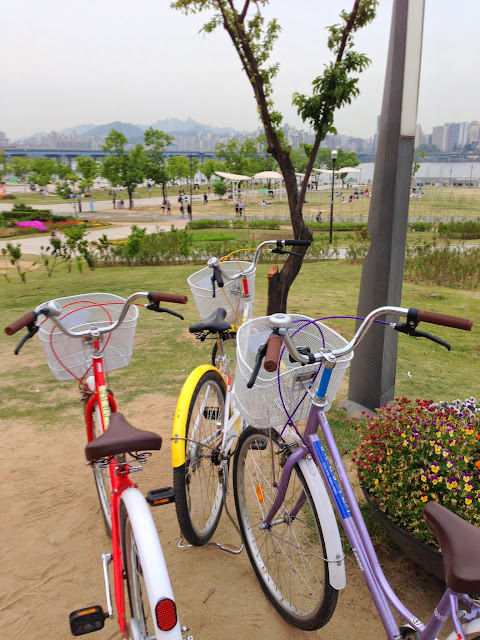 Yeouido Park is also where friends, couples, and colleagues like to gather for a picnic. Don’t worry about picnic supplies because you can get everything there without burning a hole in the pocket. 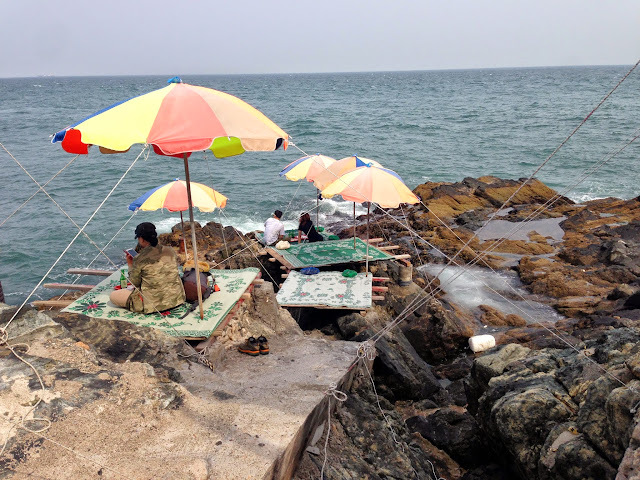 Grab one of those silver picnic mats they sell at the roadside, pop by the convenience stall for drinks, there is a fried chicken stall there (or you can try delivery), and numerous roadside stalls selling street food like tteokbokki, odeng, kimbap, and all the works. Everything is packaged for picnic-ing purposes. For example the odeng and its broth come in a bowl that is covered with a piece of plastic so that it’s easy to carry the bowl without spilling the broth- quite ingenious! We didn’t have time to hike Mt Bukhansan but we did visit Nami Island. We weren’t very enthusiastic at first because it sounded like a touristy place but we were pleasantly surprised by the number of exciting activities we could do there. Best of all, they were all pretty affordable and safe. 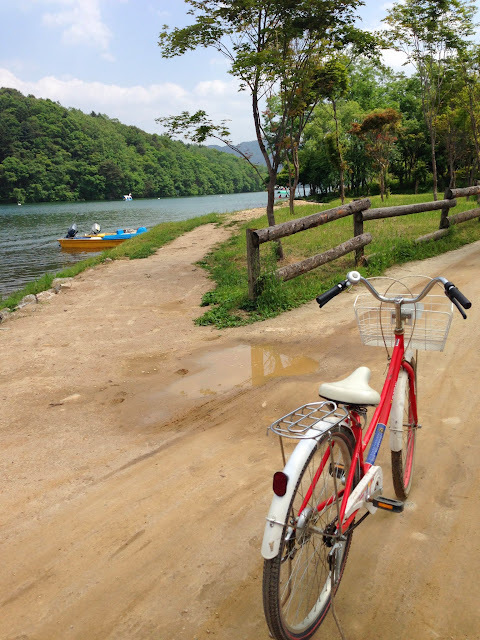 Other activities at the island include cycling, speed boating etc. If you go with the banana boat you might get wet but they provide a change of clothes for you there. 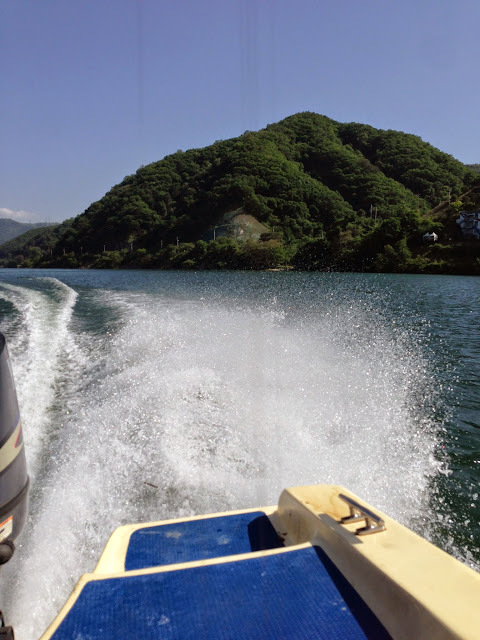 We chose speedboating because it was the least expensive adrenaline packed activity. We were thrown around our seats when our cheeky driver made sharp turns and raced across the water. Another thing I recommend is to go for a trip to the DMZ. You can book the tour with your hotel or hostel in Korea but if you want to do it in Singapore, Koridoor is the most straightforward in terms of credit card payment. It’s a pity they ran out of tickets for the dates and times I wanted so I went with another agency but it was quite a hassle to pay for the tours and it was also more expensive. Be sure to choose a tour with the Joint Security Area because that’s where you can actually step on North Korean soil. It’s not the most adrenaline pumping kind of tour, and cynics might also say it’s not worth it. But I don’t mind paying for the novelty haha. Also, the tours are run by the US military not the North Koreans. 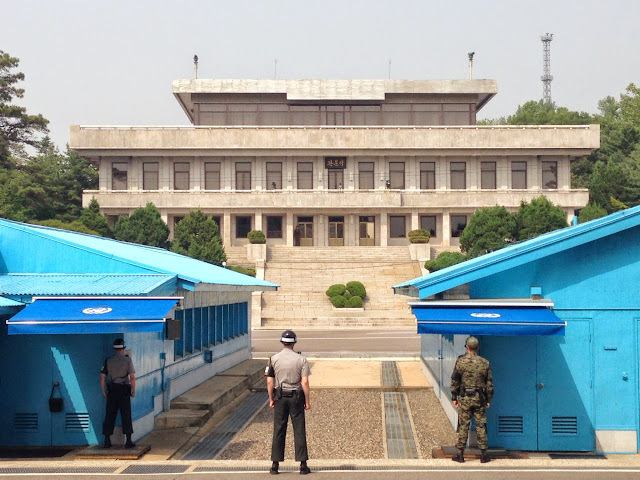 The only North Korean you will see is the North Korean soldier guarding the tan colored building you see below. The South Koreans are in blue. 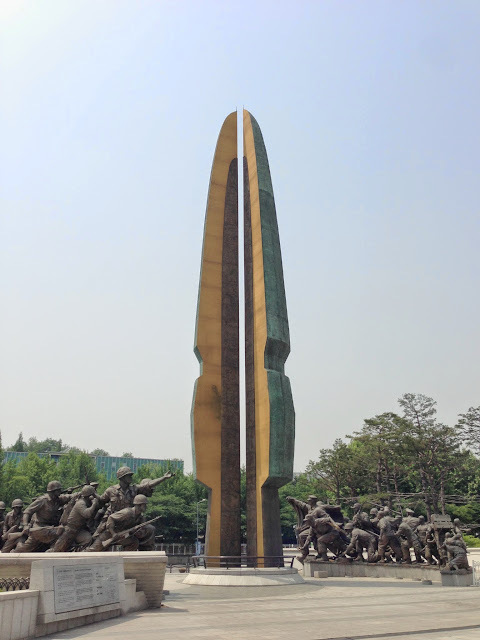 The tours also usually include a visit to the War Memorial within Seoul (which you can do yourself, it’s free). If you are interested, you should head down on your own on another day because they don’t spend much time there. 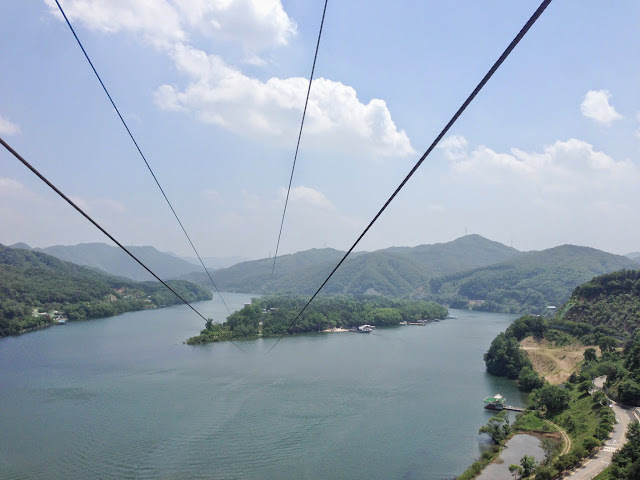 If you have time to spare, spend two nights in another part of Korea. 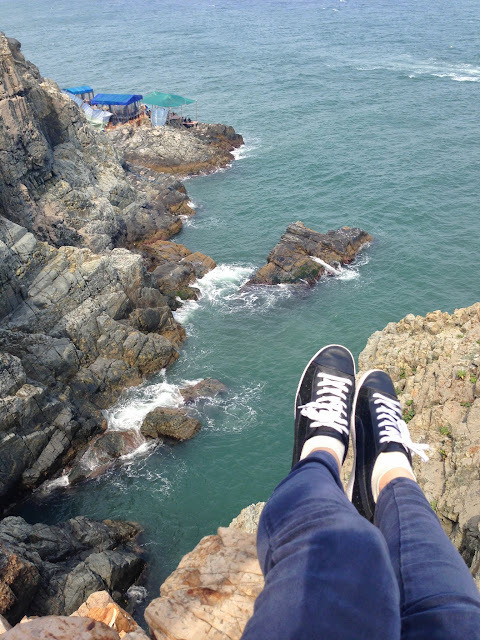 We visited Busan, and Jeju for 5 nights. 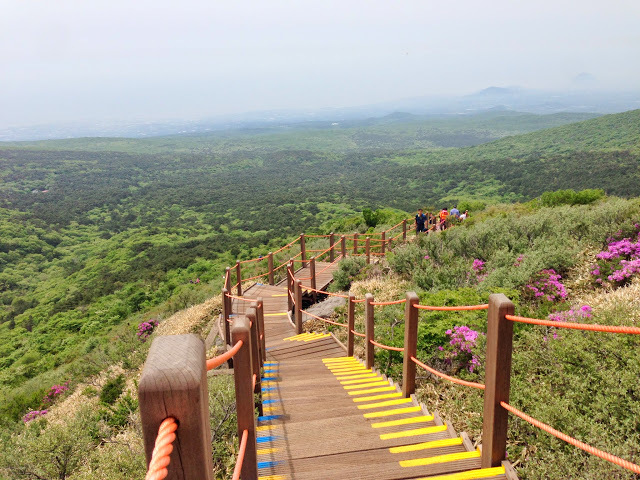 Jeju can be touristy but you can choose to go off the beaten track- cycling at Udo Island (to read more about Udo, click here), hiking Hallasan, or walking the Olle Trails. 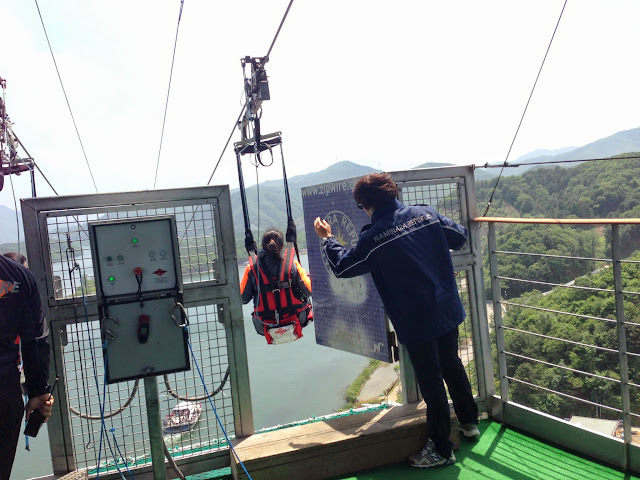 It’s a weekend destination for many Koreans who want to short getaway from the city life. Lots of elderly also go there for hikes. I was quite amazed by the trails at Hallasan because they had wooden steps all the way to the summit and shelters for people to rest at. It’s not easy but definitely do-able if you are pretty active. 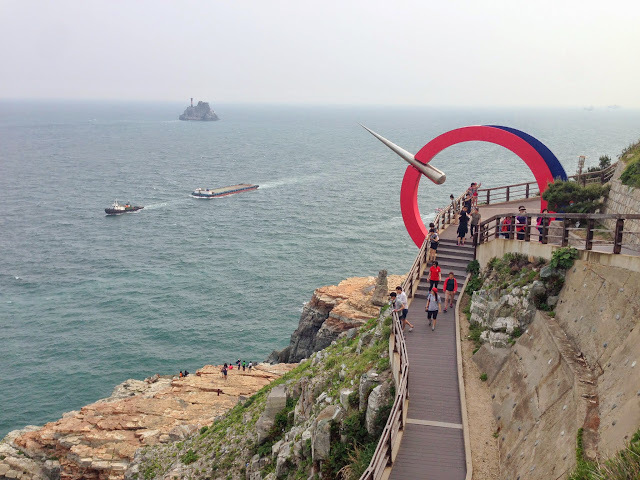 Busan is the second capital of Korea. We didn’t enjoy our stay there because of our terrible hostel (our neighbours got drunk every night and they kept coming back and going out again through the night…) and we found it extremely touristy. But if you are there, don’t miss Taejongdae. It’s a place where couples, families and tourists go. It’s very friendly to kids and the elderly because they have a tram service that touches all the main attractions of the park. I love the cliffs there. The walk down is a little steep and far but the views there are gorgeous! If you don’t want to climb back up you can choose to take a boat back to Jagalchi Market (it’s a giant fish market that is a popular attraction too) from the bottom. We also enjoyed ourselves at BIFF square which was packed with shoppers and loads of street food stalls that were quite different from the usual in Seoul. Travelling within Korea is pretty affordable. Our internal flights were about 50 sing one way. We sat Eastarjet and AirBusan (this airline is very very comfy). 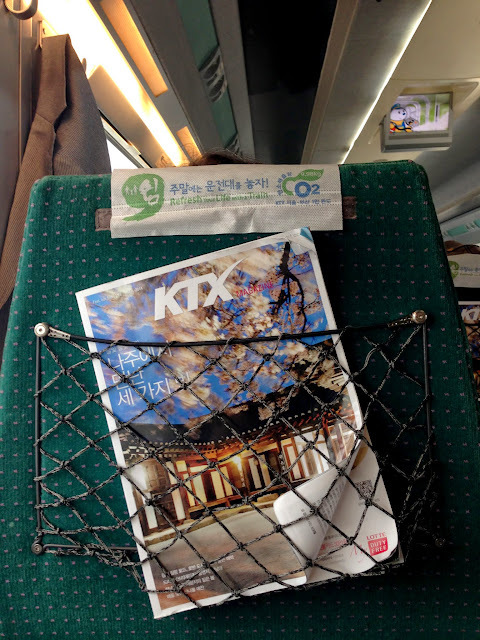 We also took the opportunity to use the KTX from Busan to Seoul. It’s also around 50 sing one way. I didn’t include many details of the planning that went into this trip but if you have any questions, ask away!